Brothers Double Up! Once again we planted Imperial Whitetail Clover and once again we are impressed more than ever. This year we planted Imperial Whitetail Clover in the spring and also planted Whitetail Oats Plus in the late fall. I took my two boys out for the Indiana youth deer hunting weekend. My wife and I took our 6 year old son out on our farm. And our 8 year old went with my brother Greg on his farm. 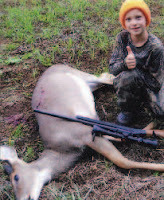 My 8 year old son, Mark, shot his second deer over Whitetail Oats Plus on my brother’s farm. Photo 1. 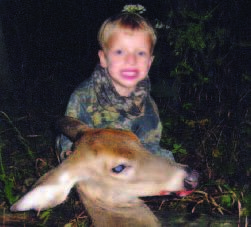 My wife and I were hunting with our son Caleb — hoping he could kill his first deer. The trail camera’s told us that there had been a lot of deer feeding on the food plots. Our Saturday evening hunt is one I’ll never forget. We saw over 27 deer and over 9 were bucks. 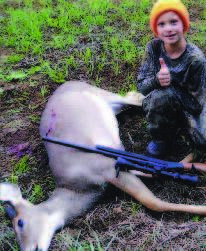 We had four bucks come in at one time and Caleb shot and missed, but was able to connect with a doe later that evening! Photo 2. From September to December every time we went out we saw 20 to 30 deer come out to the food plots. It was amazing to see how these food plots brought in the deer. We were seeing some incredible bucks also this year. My dad connected with an 8 pointer and a friend missed a 150 class buck. Thank you Whitetail Institute for such incredible products. I tell everyone and anyone about Whitetail Institute. Some friends just purchased a couple of bags. I can’t wait until next year.